This Issue’s article is an article published in April 2002 in Volume 8 of the Indian journal “Empressions” by V. Arora and K. Williams. Does your mind wobble when confronted by a mathematical challenge more forbidding then two plus two? Do you dream of becoming a Shakuntala Devi, rattling off answers to the most complicated sums in a fraction of a second? If the answer is "yes", you need Vedic mathematics. It is the doughty giant killer before whom numbers grovel and give up the ghost and predatory equations change into tabby cats. This beautiful system was locked, unrecognized, in Vedic texts until Sri Jagadguru Shankaracharya from Govardhan Math reconstructed it. He wrote a book entitled "Vedic Mathematics" in 1958, which was published in 1965 from BHU. What's the square of 85? Multiply the first digit 8 by its successor 9, The answer is 72. Find the square of the second digit, 5, which is 25. Now bring the two together. Bingo, the answer is 7225. Don't believe it. Try it out with any 2-figure number ending in 5. An introduction to Vedic mathematics is like entering Alice's wonderland, where logic is turned upside down. Division can be a process of multiplication and addition, and multiplication is by either cross subtraction or cross addition. The simplicity of approach exposes the top heavy processes of our logic-driven world. All the Vedic methods can be properly explained and they are more interrelated than the current methods: division for example is just multiplication reversed. One other advantage of Vedic mathematics is that it offers choices. The same calculation can be done by different methods. This way, Vedic mathematics actually helps in holistic development of the brain and children become more creative, inventing their own methods and understanding what they are doing. There is also often a choice about whether to calculate from left to right or from right to left. and 12 × 2 = 24 for the right-hand part. Since 1965 the subject has been besieged in controversies with some Indian mathematicians calling it a fraud. Even though it originated in India, it is ironically taught in many other countries except India: in London and Singapore there are separate centres for Vedic mathematics. Motilal Banarasidas, the premier publisher in the field of Indian Culture and Heritage have been staunch supporters of Vedic mathematics for a long time now. R. P. Jain of Motilal Banarasidas says the reason they are supporting Vedic mathematics is because it has the potential to bring about a revolution in the in the country in the field of maths. A very successful school course has been published by Motilal Banarasidas & developed in the UK, (covering their National Curriculum) “The Cosmic Calculator” by Kenneth Williams & Mark Gaskell (3 books + Teacher’s Guide & Answer Book) & made available at very low price. The subject has been promoted for social awareness through regular workshops at Schools & national level. Further publications are expected shortly and efforts are underway to establish World Academy for Vedic Mathematics, Nagpur headed by Dr. L M Singhvi. Vedic Mathematics can really bring about self-confidence in our children, so that it becomes fun with figures and not something dreadful like a nightmare before exams. Get rid of this maths-phobia & aim much higher with promising results. A weekend course in Lelystad (19th, 20th October), a weekend course in Utrecht (26th, 27th October) and an evening talk (24th October) have been arranged in Holland. Tutor: Kenneth Williams. Cost: € 108, inclusive of the book "The Cosmic Computer"
Lelystad: Samhita, Rivierenlaan 230, Lelystad (for information: Paul H. Goveia, Tel: 0320-25 87 88). Utrecht: Centrum voor Transcendentale Meditatie, Monseigneur v.d. Weteringstraat 128, Utrecht (for information: Gerda Jongenelen, Tel: 030-251 4995). The evening talk in Amsterdam will be free of charge and will start at 20.00 at H. Cleyndertweg 313, Amsterdam, Tel. : 020-6326305. See Calendar at www.vedicmaths.org for more details. Three Teacher’s Manuals – elementary, intermediate and advanced - are being produced for teachers who want to learn the Vedic system or teach it to other teachers. The elementary and intermediate Manuals are ready and the advanced one will be ready in a few months. 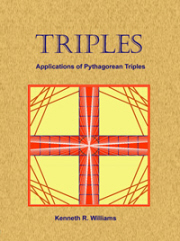 For more details see the web site at www.vedicmaths.com(books 13, 14 and 15). Can you contact us at if you know the whereabouts of Mr Somanath Mahapatra of Puri, Orissa. He was a disciple of Sri Bharati Krsna Tirthaji who reconstructed the Vedic system. If there is anyone in the UK or US conducting research on Vedic maths in mathematics education please contact Mala Nataraj at . ARE YOU TUTORING VEDIC MATHS? If you are putting on courses, talks or tutoring in Vedic Mathematics let us advertise them in this newsletter. With over 800 subscribers around the world you are sure to get a response. There is no charge as we just wish to help promote Vedic Mathematics. And as mentioned in the last newsletter if you would like to be featured in our “Tutors in Vedic Mathematics” page (not yet up) on the web site www.vedicmaths.org please send details about yourself: where you are located, what level etc. you teach, your experience/qualifications, contact details and so on. EMAIL: There is great stress in the UK, Australia and New Zealand on the learning of concepts. Please comment on whether learning strategies in Vedic maths helps to lay the foundation for learning mathematical concepts in students' later years. REPLY: On your question about how VM helps with learning mathematical concepts I am not aware of any studies on this so can only give my opinions based on personal observations and knowledge of the Vedic system. Firstly the Vedic system works the way the mind works, it is more natural and coherent and unified than the current 'system', so this must lead to greater understanding for the pupil of how mathematics works and how to go about doing mathematics. Concepts are formed based on simplicity, pattern and unifying principles and these are distinct features of Vedic mathematics. The Sutras of VM seem to describe fundamental principles and types of mental actions and since the whole system is based on these natural functions the pupils can move faster and understand better. The Vedic system also encourages mental mathematics which brings the pupils closer to the mathematical objects with which they deal and so must give a deeper understanding of the subject. EMAIL: Thank you to put me again on your list. I start to enter into Vedic Maths. My first experience is that VM creates bliss and simplicity in the manner of thinking. It is more than an effective system of maths, it is really a healing system and creates orderliness in the brain physiology. I hope that all kids in the world will have access to it in order to reduce violence in schools.